The Torquay & District branch of the Soroptimist International recently played hosts to Martin Pallett – Director of Services and Cherrie Crook – Volunteer Co-ordinator from the newly renamed Devon in Sight. Devon in Sight is a long running charity supporting people in Devon experiencing sight loss, previously known as the Devon County Association for the Blind. The Devon in Sight is a Resource Centre and Charity based at Station House, Topsham. The new Resource centre is almost complete in Topsham and they will soon be re-launching the charity with a new name and a fresh look. Martin explained that over 50 entries were received for the ‘Name Challenge’ which was set up to find a name that would be easily recognisable and capture the charity’s ambitions for the future. recently won the silver Partnership Award at the Torbay Care Trust’s Blue Shield Awards ceremony in recognition of her success in recruiting volunteers. carefully match volunteers to visually impaired people. These volunteers provide befriending support or undertake other tasks for them. Some of the clients are isolated and lonely and Cherrie is always looking for visiting volunteers, who could help clients to read their emails and post, accompany them on short walks and shopping trips or just enjoy a kindly word over a cup of tea. Clients really appreciate what the volunteers do. 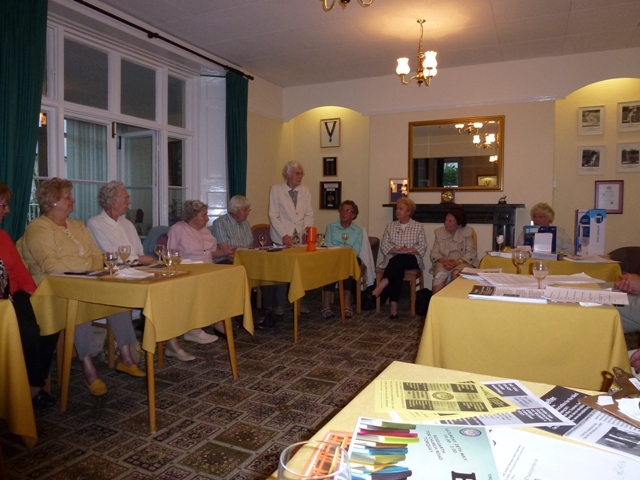 All Soroptimist members were given a copy of the quarterly Newsletter to take away and read at their leisure. A vote of thanks was given by Helena who said that the Soroptimist Club members are keen to become involved and plan to spread the word. At a brief discussion after the talk it was decided that our members would organise a fund raising event for this charity.